I know that looks scary with all of the warning signs, but its just to tell people there is no running water in the house. Really not much has changed other than we stapled down the floor temporarily and we slapped some paint on the wall. Still there’s a lot left to be desired here. While it looks ok in pictures, the subfloor is actually rotted beneath that basic vinyl flooring. We have no idea how bad, but it’s fine since we already plan to replace everything. New lighting, tile, floor, vanity top, and fixtures, it’s going to be beautiful. We have some really cool plans to reuse the mirror and you will have to see what we have in store for that. 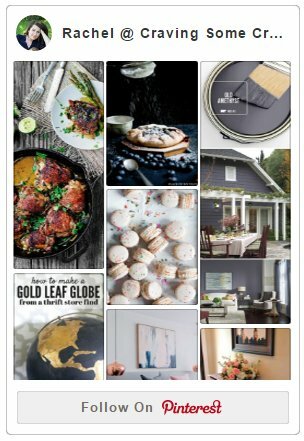 If you remember earlier this year, I made a mood board to give myself a general idea of what we planned to do with this space. It’s a lot for a small bathroom, but we are so ready for this! Bring on the hammer and demo! Have you redone a bathroom? Thankfully, we have another shower in the master, but living with one bathroom is going to be an adventure. Stay tuned for all the details! Oh no, the floor is rotted. At least you guys already know that so there will not be any set backs. I can’t wait to see. I am a renter so i love to see diy projects!